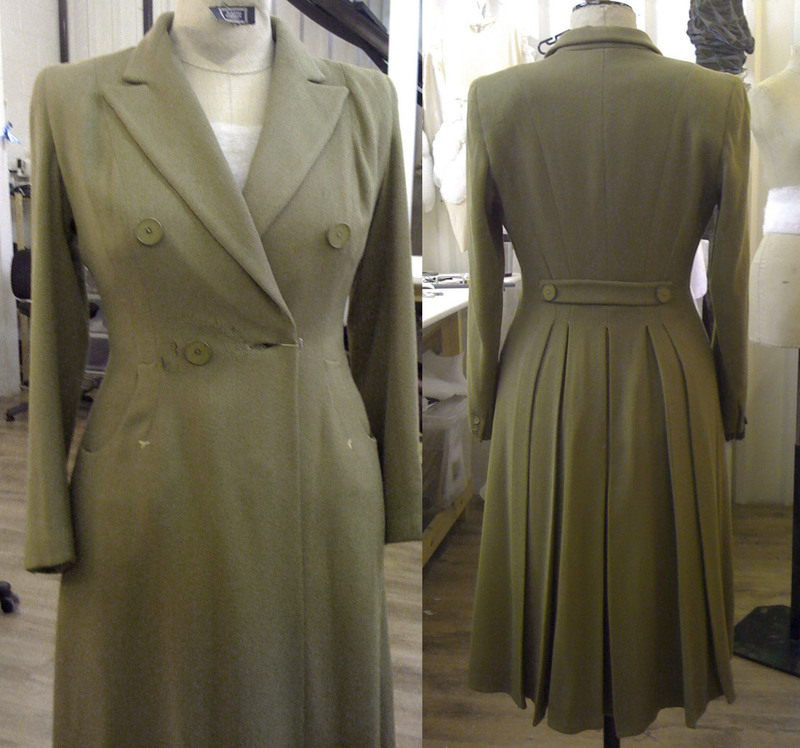 The VV 1940’s coat pattern is now available in six individual sizes. Here’s what it looks like in tweed compared to my first make in cavalry twill. Ready for an Easter parade I am in my exceedingly green coat. It’s a colour that cheers me to look at… but I need to be in an exuberant mood to actually wear it. The pattern was a 9.65€ find at a local vintage fair and with my new zeal for old patterns I was impatient to try it out. So late one evening at the costume studio I quickly chalked the pattern lines on to my pre-washed linen, lengthened it, cut it out and dived into sewing. The water was cold! Caught out again by the generous amount of pattern ease in a vintage pattern plus it being a bit too big anyway I needed to make a fair few alterations as I went along. That was the night I accidentally got locked in the building and so had not much else to do but to keep on sewing until someone with keys could come back and unlock the front door. I got a lot done by the time I was actually let out. It’s unlined and the seams are all edged with bias cotton binding. Happily linen is forgiving and easy to work with so all my un-picking and messing about with the fit wasn’t too obvious in the end. 7 rows of Top-stitching on collar, cuffs, pockets & hem. It’s a great shape pattern and I will make it as a jacket next for a summer suit with a pair of trousers like these Vogue 5757 I think.